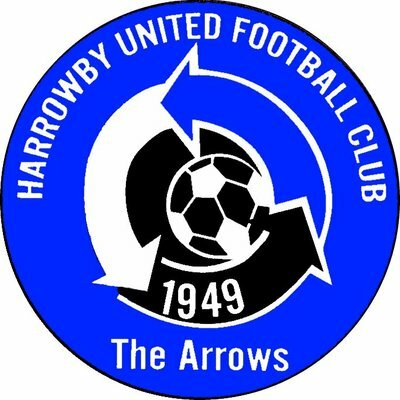 The original Harrowby United were founded in 1949, playing in the Grantham & District League until joining Division 1 of the Central Alliance League in 1967. A season after joining this league, the club were transferred to Division 1 of the East Midlands Regional League, before being promoted to the Premier Division at the end of the 1973/74 season. In 1985, the league changed its name to the Midlands Regional Alliance League, and Harrowby United went on to win a league and cup double at the end of the 1989/90 season. This earned them promotion to Division 1 of the United Counties League, where they remained until finishing as runners-up in the 2002/03 season. However, after a couple of strong finishes in the Premier Division, the club finished bottom in the 2005/06 season and dropped back into the Grantham & District League. After this, the club spent a season in the Lincolnshire League before transferring to the Central Midlands League Supreme Division and changing name to Grantham Rangers. However, after a season of struggle, the club folded. However, a new Harrowby United formed in 2012 when Grantham & District League champions Beehive United changed their name upon earning promotion to Division 1 of the United Counties League. Promotion to the Premier Division followed in the 2013/14 season, but a season of struggle in 2016/17 saw the club once again relegated to Division 1. In the FA Cup, the club has only ever won one game in its current incarnation, with an Extra Preliminary Round victory over Thetford Town in 2016/17 (this was then followed by a 4-1 defeat at Soham Town Rangers in the Preliminary Round). The new club has also experienced limited success in the FA Vase, having only gotten as far as the 1st Round; this was most recently achieved earlier this season, when they beat Clifton All Whites and St. Andrews before losing 2-0 to Rugby Town in extra time. I hadn't intended to leave it almost three months between this groundhop and the last, but my dad catching pneumonia and being unable to do much of anything for ages put paid to any plans I had (I first learnt about this when I was told that he had to cancel our planned visit to Stamford - just after his birthday - because of it). This also meant I wasn't getting to any games at Carrow Road either, although with our form declining at an alarming rate, this was very much a blessing in disguise. All I was really able to go to at this point was Yaxley games, but even with that I hadn't watched any football in three weeks by the time this game rolled around. This fact was even more annoying considering what had happened the week before when, in some bizarre quirk of the fixture list, Yaxley played Harrowby at home and won 10-0. After that result, I convinced my mum to drive me up to Grantham for the reverse fixture so I could hopefully see a similar amount of goals. The first half was absolutely dire from both teams, with very few chances being created and both teams struggling to deal with a very muddy, slippery pitch. The conditions probably benefited Harrowby more, as it really limited the ways Yaxley could play. Nil-nil would have been a fair scoreline at half-time, but just before half time a mix-up between one of the Harrowby defenders and the Harrowby goalkeeper gave Jack Saunders, returning from a two-month injury outlay, an easy goal; the defender had left a through ball for his keeper to collect, but unfortunately for both of them the ball wasn't moving quickly enough and Jack Saunders nipped in, rounded the keeper and tapped into an empty net. The second half started in much the same fashion as the first, but from virtually nothing Harrowby equalised on 53 minutes through Luv Peberdy, a long ball over the midfield catching Yaxley out and leaving Peberdy through on goal to finish. The game then ebbed and flowed for just under 20 minutes, with Yaxley and Harrowby both creating (and wasting) chances, before a Yaxley corner was converted by Stuart Wall on 71 minutes to make it 2-1. 10 minutes later, a Dan Cotton assist set the young Cameron Stump through on goal to make it 3-1 to Yaxley in convincing fashion. Harrowby had a few chances to possibly get back into it after that, but all hope of that was well and truly ended in stoppage time, with an excellent Joe Butterworth pass leaving Liam Hook through on goal to make it 4-1 to Yaxley. Dickens Road is a fairly basic ground - and one that was seemingly undergoing renovations on my visit - but it is far from the worst I have been to. The only area of cover at the ground - other than a small area in front of the clubhouse - is the main stand on the far side, which has a seating area in the middle for around 100 people and two standing areas (one on each side) which can probably hold a further 100 people between them. However, on my visit, the standing areas in the main stand were cordoned off as they were being used to store debris from the renovations: looking at photos of the ground on other blogs, this seems to have been red and black fencing panels, which were presumably removed once the club decided to change colours from red and black to blue and white (for whatever reason). This is also why some of the main stand is blue and white while the rest is (or at least was, on my visit) red and black still. In any case, the rest of the ground is open hard standing, with the ground probably having an overall capacity of 1,000. I'd also say that, other than next to the main stand or clubhouse, there is little room for the club to expand, if the need were to ever arise.